I am writing from my friends’ apartment in Brooklyn, where I have come for a visit. For the past hour, I have been trying to figure out how to cover up what I did to their gingerbread house. After they went to work this morning, I ate a bowl of cereal and poked around their place. There is–or was–a neat gingerbread house on the dining room table. There was something wrong with it, though: pieces of twizzler were coming out of the chimney, which made it look like it was on fire. This detracted in a major way from its festiveness. So I ate one little piece of chimney twizzler. Unfortunately, the chimney twizzlers turned out to be structural support twizzlers, and now I am in an emergency gingerbread construction situation of Habitat for Humanity proportions. I tried to prop the walls back up with some frosted gingerbread men that I found in the cabinet, but they weren’t to scale. So I ate them too. Then it occurred to me that my friends were probably saving the gingerbread men for a holiday party. At this point, the right thing to do is shop for another gingerbread house kit, twizzlers, and some gingerbread men. But leaving the apartment presents its own set of problems. For one thing, when the Bloggess linked to this site on Sunday, the ends of my hair spontaneously combusted from the surprise of so many new and welcome visitors. Now my hair has a feathery shine to it– which is fine, but let me remind you that a 20-year-old derelict posing as a licensed hair dresser recently cut my bangs into the shape of a rare tropical fern. As a result, a normal person might mistake me for a feral peacock right now. A slightly damaged person on two glasses of chardonnay might even report me to the New York Department of Environmental Conservation, Fish & Game Division. And in Brooklyn at happy hour, it’s safe to assume everyone’s tied at least two on. I’d rather not get poached or tranquilized today. I’m pretty sure it would make me an even worse house guest. 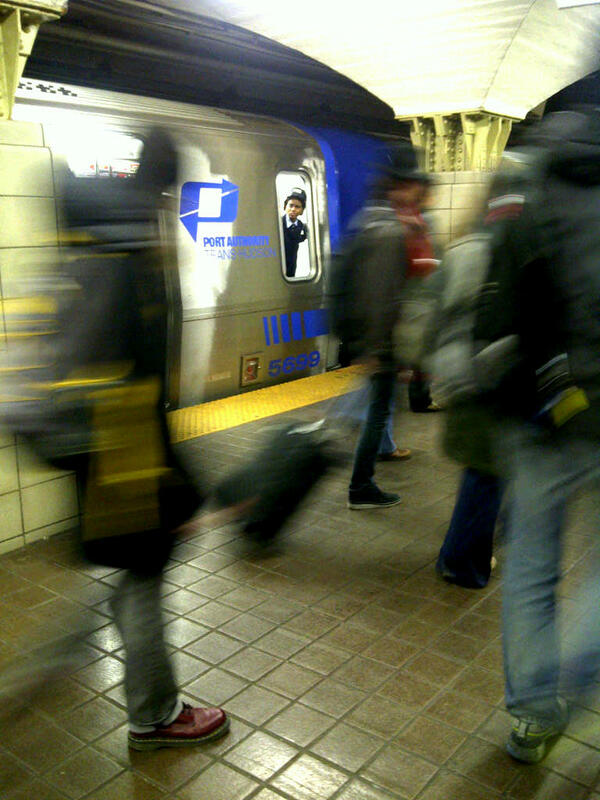 This is probably a Fish & Game ranger posing as a subway conductor. So I am going to sit tight for now. I am going to sit here and hope that when my friends come home, (a) they’ll understand that a broken gingerbread house is an important social commentary on the mortgage backed-securities crisis and the perils of home ownership, or (b) they’ll be distracted by the Almond Joy ice cream I made them. This is the best ice cream I’ve ever made. It’s not eggy, or too heavy, or over-rich. It’s creamy and almondy. I began by tweaking Helene Dujardin’s adaptation of the toasted coconut ice cream in David Lebovitz’s The Perfect Scoop. The recipe called for one little teaspoon of rum, which made me sad, so I added more. While the custard was churning, I threw in chopped Almond Joys and slivered almonds. The result was the best ice cream I have had outside of Italy. Preheat the oven to 350 degrees (or use a toaster oven). Spread the shredded coconut on a baking sheet and toast until light brown. This will probably take a little longer than 5 minutes but it will burn so fast with so little warning, that it’s really worth it to stare at it at after the five minute mark. Remove coconut from the baking sheet immediately and let cool. Separately, toast the slivered almonds if you will be throwing some in (this is optional but I loved the added crunch). In a large saucepan over medium heat, warm the milk and the cream with the salt and the toasted coconut. Once the mixture is warm, remove it from the heat and cover it so that the flavors steep into the milk and cream. Let it sit at room temperature for an hour. Pour the mixture back into the saucepan over medium heat until it’s hot. In the meantime, whisk the egg yolks and the sugar together in a medium bowl. Transfer the entire thing back to the sauce pan and heat over medium heat until the mixture is thick enough to coat the back of a wooden spoon (about 10 minutes). Be sure to stir and not boil the mixture. Place a fine mesh sieve over a bowl. Remove the mixture from the heat and pour it through the sieve. Get all the coconut juice out by squishing the coconut against the sieve with the back of a wooden spoon. (Then discard the coconut shavings.) Stir the rum into the mixture. Let the mixture cool to room temperature and then put the bowl in the refrigerator to chill. Chill for as long as your patience allows. I chilled mine for approximately 3 hours. Pour the mixture into an ice cream machine and churn pursuant to the manufacturer’s instructions. A few minutes before you will remove the ice cream from the machine, toss in the chopped up Almond Joys and (if you like) the slivered almonds. Serve immediately (for soft ice cream) or freeze for several hours (for harder ice cream). N.B. Alas, if Thunder were here in New York, it would be so easy to blame the destruction of the gingerbread house on her. So very easy. Nobody does great ice cream like David Lebovitz. Except now, apparently, you. This is beautiful. When you’re back in Huntsville, though, I would recommend making the Baconator a recipe of David Lebovitz’s bacon ice cream. Cindy, I heard that ice cream was delicious! I am not sure if I would like bacon ice cream, though. I’ve tried a bacon martini and a maple bacon cupcake and I wasn’t a huge fan of either. But maybe I could be talked into it for Scott’s birthday, or something sure to be bacon-centered! L-O-V-E your blog! I was suffering from a bout of insomnia the other night, which meant that I was catching up on all of my fave blogs on my iPhone, in bed, while trying to find sleep. I found a link to your page via The Bloggess, and I promptly read all of your posts because they were so very F-U-N! I love to cook, so I really appreciate the recipes (totally making the cheesy poofs and beef braised with wine and mint ASAP). I’m a lawyer too, so I feel your pain . . . I also blog (poorly, in my case!) about my more creative tendencies. On top of that, I married another lawyer. Oof. Thank goodness my husband is not an uptight, type-A lawyer like me! We live in Alaska, though I grew up with two parents from the South. This means that, in addition to loving my smoked salmon and moose sausage, I have a deep appreciation for the wonders of fried EVERYTHING and delicious Southern specialties. Ah yes! I know the late night iphone blog scroll quite well. I am so glad you visited and liked it. Where in the South is your family from? I like your blog a lot and am so curious about life and law in Alaska. Will you have more posts coming up? The world needs to know how this house-revitalization is coming along! It sounds like quite an adventure. But if you don’t mind, I may keep your blog to myself. If Scott finds out that you have moose sausages in Alaska, he is going to want to move there asap, and I only just got to Alabama. Take care! Dad is from Jackson, Mississippi, and I have family in Mississippi, Louisiana, and Arkansas. Despite all of that, I have never been to Alabama . . . at least not that I can remember! As for blogging, I’m a delinquent blogger. I have a few posts in the hopper, so hopefully there will be more to come soon. Cheers to you, Scott, and Thunder! 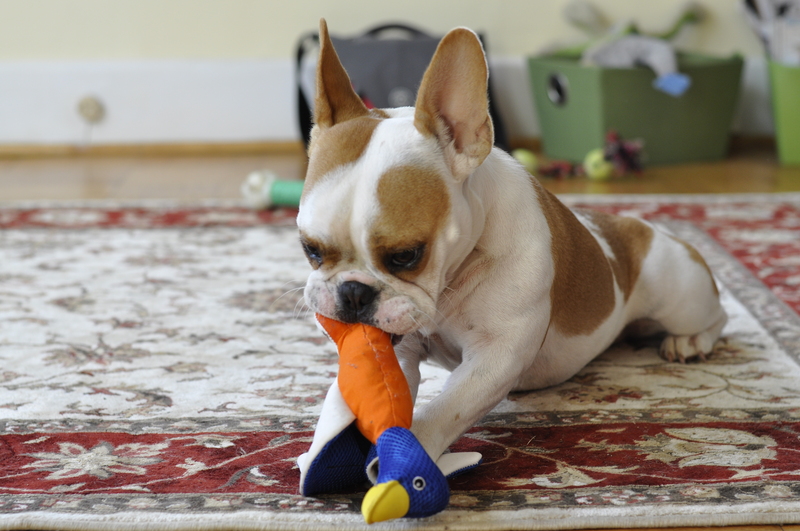 You have a new post – which makes me very happy. But I didn’t get the email I signed up for – which makes me very sad. Totally assuming I did something wrong and will go sign up again. Good thing I came back to catch up on the back log of posts I had not read yet. Some people call it wasting time. Since I am a food blogger, I call it research. Stacy, it’s not you! I don’t think it’s me either. Sort of. After a lot of head scratching, I discovered that the email DID get sent, but it went into everyone’s spam folder. Apparently, the internet decided I was a fraud, or dangerous, or just boring. Maybe because I had three hyperlinks in there. If that’s the reason, though, it’s funny– because I linked to innocuous things like ice cream recipes and food blogs run by classy french ladies. Thanks for your patience and the feedback- it helps to know some people didn’t even get my second attempt. Cheers! Daily Digest just came through! In my inbox. Yay! Thanks for persevering. I received the 7×7 Link Award which means I have to pass it along. You have a wonderful blog and were one of the first people I thought of! So Merry Christmas! Oh yeah, there are things you’re supposed to do. You can read my post and figure it out. Did I say Merry Christmas? Sandy, I posted my sincere thanks to you right on your blog, so here I’ll just say thank you again, and Merry Christmas right back! Ha-sounds like you were definitely working on the theory of if it does not work-eat it-when it came to that gingerbread house! Funny. Thunder was a good idea for the blame-no one could be mad at that adorable pup. The ice cream recipe was saved, I cannot pass on anything that includes almond joy candy-thanks for posting this one. Glad I stopped by-this was an enjoyable read. Hi Tina, I’m so glad you enjoyed it. Have you used those green mint chips you mentioned on your blog? They looked interesting, and festive at this time of year! I’ll visit again soon– merry baking! I blame everything on the dog (What? I don’t know how he climbed on top of the fridge and broke your plant. Maybe he’s part cat?). Toddlers are good too. They eat everything! 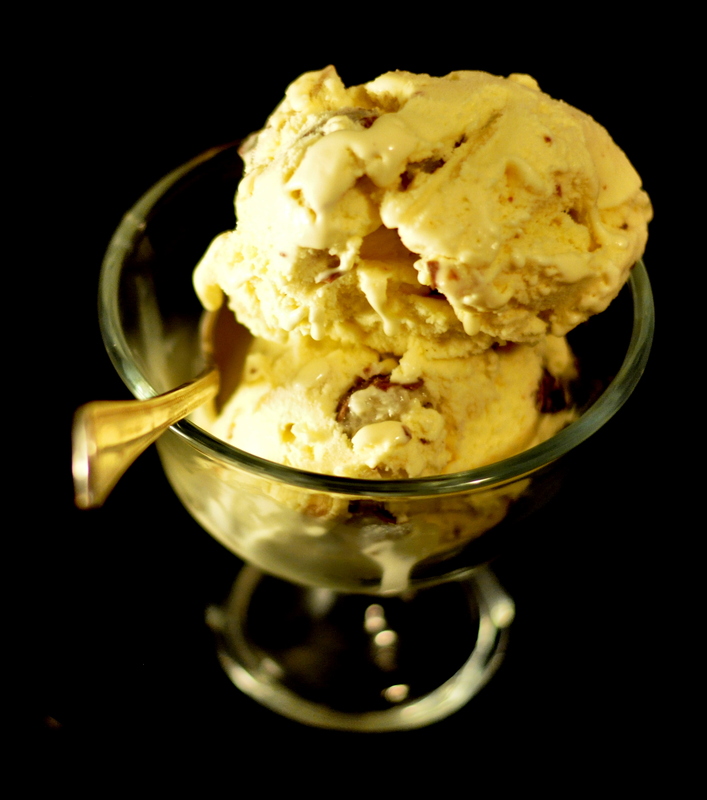 I was just thinking of making homemade Almond Joy candies; but this ice cream is tons better! Good point- Thunder may indeed be part cat. She’s already a mix of dog breeds, so it’s not out of the question. I saw almond joy candies recently– was it Joy the Baker? Maybe it was just on Tastespotting. Wherever they were, they looked delicious. 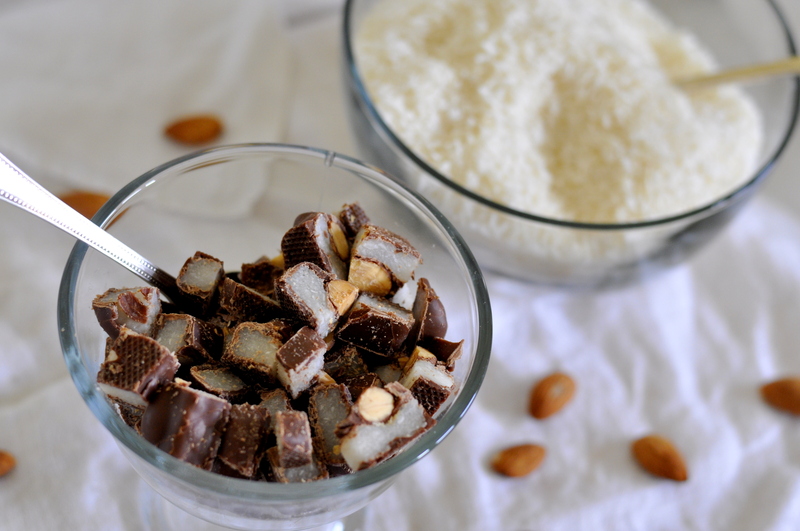 Someday we will be so put-together that we will make almond joy candies and use THOSE in the ice cream. Someday. And we will win a big prize when we do. Do you mind me asking what kind of dog she is? She is adorable! Thanks for the recipe. Anxious to give it a try! 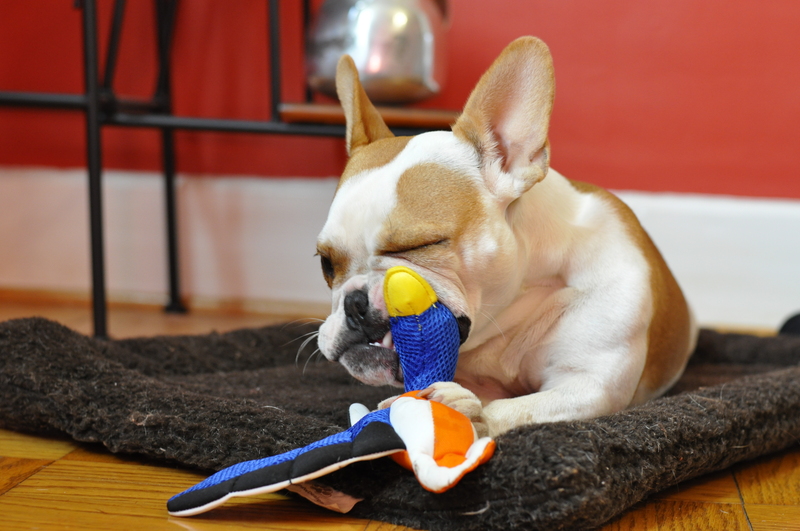 Jocelyn, she’s a cross between a French bulldog and an English bulldog. She’s 2 now, and super athletic. (She can jump 4 feet high!). I could not be happier with the breed–she’s so cuddly and affectionate. Ann, I’m so glad you visited, and thank you for the kind words! I’m having a blast. My next project is to make the recipes easier to print out- so you could just download and print. Thanks for bearing with the site in the meantime! It’s just in how you portray it. I’m sure Thunder could manage to book train/plane tickets and get through security and make it up there then disappear in time to make you look bad. She’s so shifty looking. Cripes. I get sick, miss one of your posts, and you go and get famous on me. Riiiight. I’m pretty sure it’s the other way around, especially after your gingerbread house is featured on the Food Network. I am upset because I just found out about this famous gingerbread house person who sells cool cookie cutters for house-making, and it’s too late to order them before your contest is over. But did you see this? Tiny gingerbread houses meant to sit on the side of a mug. I do seem to recall seeing them. Brilliant, I say, brilliant! I’m assuming you destroyed your friend’s gingerbread house to eliminate my competition? Oh, good golly! I just spent the last two nights reading all of your blog posts – via the mention from The Bloggess. I am sort of a blog stalker. My husband got mad around 3 a.m. from me laughing out loudly (LOL!) and said I needed to shut off the computer. I promptly told him that I was simple making out a Christmas list for him, and that if he was going to be so scrooge-like, I would spend all of my saved-up Christmas money on 1) stapling gingerbread to my face 2) The ER visit that would most certainly happen, after I staple holiday cookies to my face, and 3) Swing dance lessons for the two of us. He gave me a really yucky face and went back to bed. Ha! I LOVE YOUR BLOG! (and no matter what The Bloggess says, I actually skip AHEAD to your recipes, to see what I can make for my unappreciative-of-swing-dance-lessons husband! Wendy, it’s lovely to hear from you! Thank you for the kind message. I love the Bloggess too. I also love to read on the computer at night, which I am sure drives people on this end as crazy as it does on yours. But how else are we to keep up with all the newest developments in swing dance and cookie stapling? Maybe if you threaten your husband with MODERN dance (see the most recent post), he’ll see that swing dance is a good compromise? Take care! Hi Jennifer! Thank you so much–what nice things to say. I struggle with the photos–it’s hard to find enough light, and it’s hard to snap a few before Scott or Thunder eat whatever it is I’m photographing! It’s been raining here for a few days, and Thunder has been deprived of her outdoor sticks and tennis balls. This is when she starts eying the Christmas tree with real seriousness. Cheers!